Don't miss the November 28 half day program at the library - we will have life-size inflatable dinosaurs and an awesome program about the mesozoic era. See below for more details, and for information on how to register! Seats are limited ~ please pre-register by calling the Children’s Room at (978) 456 – 2381. Dinosaur tracks lead right to our library! Have no fear, Dinoman is here! With magic, merry mayhem, and magnificent props, you will be taken on a trip throughout the mesozoic era. How do we know dinosaurs were here? What is a fossil? How are they made? This program is fun and informative for all ages: we will learn about the age of the earth, how it is divided into eras, how fossils are formed, dinosaur behavior, and the newest finds. 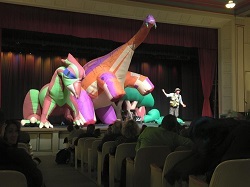 And did we mention that there will be life-size inflatable dinosaurs on stage? ?